Our product- SuperWheel using our patent pending ‘Weight(mass) to energy conversion technology to improve cycling efficiency is the only alternative to electric power assistance, such as the E-bike , E-wheel or the E-power conversion kit. The power assisted SuperWheel is 100% human powered, does not need a battery, therefore there’s no need to be consuming electricity today and no electronic waste in future. The product is convenient to use, environmentally friendly and there’s no regular recharge of a battery needed, no range limit to worry & no big bill to replace the battery every few years. The company was launched in 2016. Commuters cycle to work or school, or cyclists that enjoy cycling without the hard work on leisure & recreational uses. Imagine tourists cycling around Dublin on the SuperWheel viewing all the amazing attractions, SuperWheel will give them a much more comfortable journey and will leave them feeling a lot more refreshed afterwards compared to a standard bike. People who care about the environment, choose not to consume the electricity today and without the electronic waste in future. To build a business it is long and challenging but can be a very rewarding journey. It will require a long-term plan and a short/medium strategy to overcome problems/potential problems in each stages. There are good business support and development structures here in Ireland, such as the New Frontiers program, an excellent entrepreneur development program by Enterprise Ireland. Talk to your Local Enterprise Office for advice. The team is made up of myself Simon Chan, Charlie Fegan, Colleen Murray and Oisin Murphy. I am the founder and Charlie’s the co. founder of the SuperWheel and does the manufacturing of the wheel. Colleen does the marketing and works on all our social media sites, and Oisin helps with the promotion and marketing also. I prefer people to call me Simon. My passion to develop a new bicycle began when I was a teenager. I believe that the development of bike technology must be based on fully utilizing human generated power and I have spent years researching and developing this technology. My other inventions including a high efficiency bike pedal that has successfully completed the proof of principle testing with the University of Ulster in 2013 and is currently licensed for manufacture. Engineering is Charlie’s passion, He is a creative and experienced engineer who loves exploring new technology and has been a partner in an engineering company for the past 19 years. We are currently running a crowdfunding campaign in Indiegogo, https://www.indiegogo.com/projects/superwheel-revolutionary-power-assistance-system#/ and we hope to raise enough money complete the production model development and start the manufacturing process. We are working on the production model development, the improvement of aerodynamic design and the reduction of weight. We are initially launch the 700c model which is suitable to use on both road & hybrid bikes with 700mm, 27 & 28’’ wheels. We would like to extend our product range to all sizes for different type of bikes in future. In addition, we also working on a Weight(mass)- to- electric conversion model for the front wheel. I wish I could afford all the testing equipment for tests and measurement, at present we have to wait for the university to do the development/testing work, and we have to wait for a long time and it’s costly. I talked to many people on-line recently, and there are 2 questions concerning the SuperWheel –Weight(mass) to energy conversion technology(WTECT). A, Is SuperWheel a perpetual motion machine/device? SuperWheel is using the ‘Conversion of energy’ method to convert the reactive force of weight to turning power, our Patent attorney Brian O’neill of FRKelly , describe SuperWheel is a new type of energy conversion system. B, So, where’s the additional energy come from ? 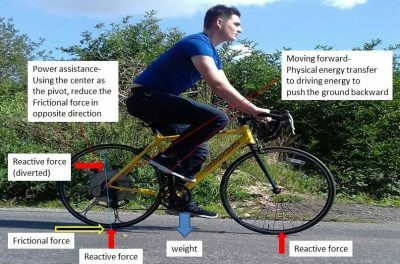 The reactive force/energy is the extension/ link to weight, which is always there, but has never been used before.. SuperWheel’s Weight-to-energy conversion technology diverting this force/energy to facilitate rotation, therefore, improve cycling efficiency. How do you do it and what was your first technical challenge for the four years development ? The Hub(weight) and the rim section(reactive) divided into 2 separate sections and connected with the spring mechanism, which would allow the reactive force diverted to facilitate the rotation. Our first challenge was.. when the hub & rim section are separate, how can the energy be transmitted between these 2 components/sections? Inspired by the Oldham Coupling(invented by an Irishman John Oldham 1779/1840), we developed a transfer dish(the torque disk) for the energy transmission.